Real estate in Braxton Village is very affordable, and the community is filled with a diverse range of differently styled homes. Especially when you consider the great amenities it has to offer. They feature many different home styles including, ranches and 2-story homes in a lot of different models where each home has its own unique appearance. Prices range in the mid $150's to the mid $230's. 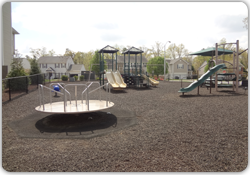 The subdivision features a community pool and a newer playground that was just recently improved. Braxton Village is also conveniently located right down the road from Holly Grove elementary, Holly Grove Middle, and Holly Springs high school. Braxton Village has its own Hoa, click here home owners association that is very actively involved with the community, including a Neighborhood Crime Watch Program, a community center with swimming pool, special seasonal events for promoting resident camaraderie. The homeowner dues are billed quarterly, one of the lowest fees in Holly Springs in which they provide a community pool and playground. The subdivision does have restrictions so make sure you check out there site. 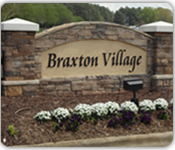 If your interested in learning more Braxton Village has a facebook page, you will need to send request to join.